HSBC has joined a growing list of UK banks who will soon charge extra interest on credit card transactions which are used for gambling. 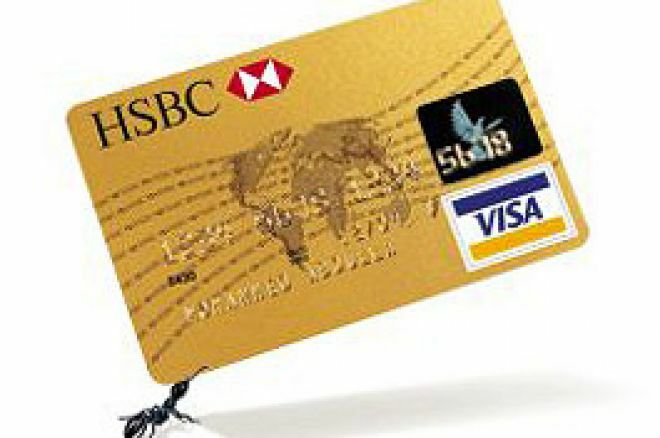 Poker players who use their HSBC issued credit cards can expect to pay more from February 1st. HSBC customers are well known for having troubles when it comes to funding their online poker accounts. To combat fraud, HSBC often block transactions until the customer advises their bank that the transaction to a specific company is OK to be processed. Now, following on the back of other financial institutions, HSBC are treating gambling transactions, which include online poker, as cash advances rather than purchases. This means customers face a much higher interest rate. Rates between 21.9% and 27.8% are on the agenda for credit card users. Previously, rates of between 15.9% and 22.9% were standard. A HSBC spokeswoman said, "This is one of a number of changes we have made to our credit card offering recently to bring us in line with the competition." There are currently no credit card industry policies in regards to gambling in the UK. MBNA, NatWest, Egg and soon HSBC charge at the cash advance rate. Whilst Barclaycard and Lloyds charge gambling spending at their much lower purchase rates. Citibank credit card holders have it even tougher. The bank stopped processing ALL gambling transaction requests by their customers in 2004. Citibank is a US owned company. The Association of Payment Clearing Services (Apacs), said people in the UK spent £1.51bn on gambling via their credit cards in the twelve months to June 2006. If you're a credit card user, it may pay to shop around when using your Visa or Mastercard, for online poker, in future.